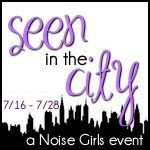 Welcome to the Noise Girls Seen in the City Giveaway Event! Want to learn more about the experiences the Noise Girls had preparing for this event? Check out all of the reviews and then enter to win your favorite packages! The Casual Prize Package features a variety of items to help you walk the city in style. This package is great for moms as it features a stroller for the little one too! So get out and check out the city!